Studio Accessories was started a year back, by Neha Sehgal and Nidhi Khanna, a NIFT designer. Each product of ours is designed and manufactured by us. It's something we love to do, it's our Passion. It's a amazing feeling to make people happy and this is exactly what we do, bring a smile on there faces when they wear our products. 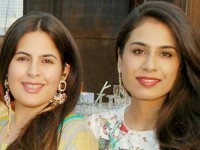 Sisters Nidhi Khanna, a NIFT designer, and Neha Sehgal, started Studio Accessories in the year 2014. They design and manufacture all the products under their brand, it's something they love to do, it's their passion. Your orders shall be packed and shipped across through reputed couriers only. Please do not accept the shipment if it appears damaged on arrival. Please reach out to us within 3 days of receiving the product should you have any concerns for us to review, and we shall be happy to help you.